New Hampshire municipalities with fewer college-educated residents, which generally offered strong support for Donald Trump two years ago, swung toward the opposing party in the 2018 midterms. Full report here. Compared to the 2016 presidential contest, these municipalities shifted more sharply toward Democratic congressional candidates than towns and cities with more college-educated residents. 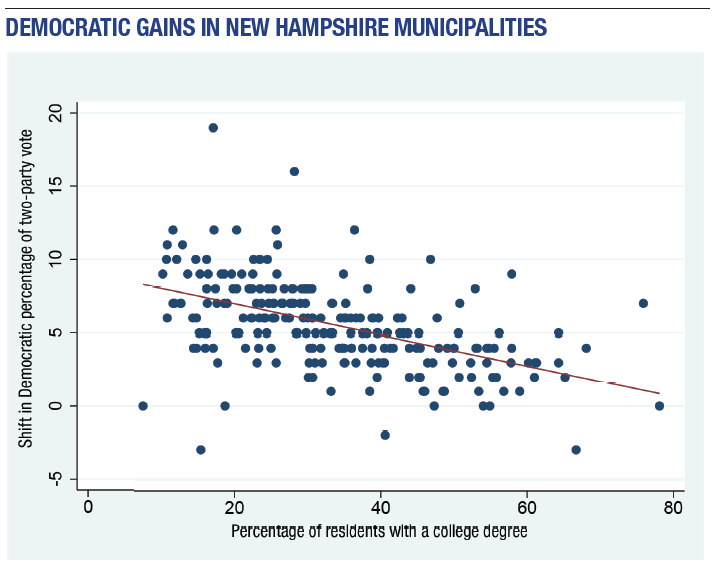 This Democratic shift remains evident even when one compares New Hampshire’s 2018 House elections to its 2016 House elections, although in this context the stronger Democratic swing occurred in municipalities with relatively more college graduates. The midterm results raise questions about the strength of the bond between the Republican Party and Granite State voters without a college degree. In 2016, Hillary Clinton carried just 37 percent of New Hampshire voters with only a high school degree, 11 percentage points lower than Barack Obama’s support in 2012, according to exit polls.